A sample wedding card is a general term used to classify cards used in a wedding celebration, whether it is invitations, thank you cards, or RSVP cards. Despite technology taking over every aspect of design, physical versions of wedding cards are still being used for today’s wedding celebrations. Guests still like to receive a piece of paper with ribbons attached to it and glitter sprinkled over the page. Here are some beautiful wedding card templates to use for your wedding or organizing one for a family member or friend. Fall, together with spring are two of the best seasons in terms of climate. Fall and spring have the right balance of heat and cold unlike summer and winter respectively, where the weather either burns your skin or freezes it. Additionally, fall and spring make you want to take a stroll or go on a hiking trail as the weather is mild and clear. Fall (or autumn as it is alternatively called) is characterized by tree leaves turning red, yellow, or orange. It is truly a sight to behold and makes you want to take a photo and post it on your social media page. This fall wedding RSVP card template uses a simple white-colored background but incorporates images of autumn leaves. You can edit the text for your own wedding event. This template has a 5.5 x 4.25-inch file size and was made using Illustrator, InDesign, MS Word, Photoshop, and Publisher. This is a pink wedding invitation card template that takes full advantage of the color pink. The photo of the couple occupies the upper portion of the invitation with the text and background image resembling a flower. The upper portion of the invitation card is also colored pink. The size of this template is 5.25 x 7.25 inches and it was created using MS Word, Photoshop, and Publisher. This “Mr. and Mrs.” printable wedding card also uses a simple minimalist design. The only image used for this wedding card PSD template is the small heart located at the center template. When you purchase this wedding card template, you get both the red and black versions of the heart design, 5- x 7-inch high resolution JPEG files of the artwork (suitable for professional printing), and high resolution folded card mock-ups, designed on an A4-sized paper (suitable for home printing). 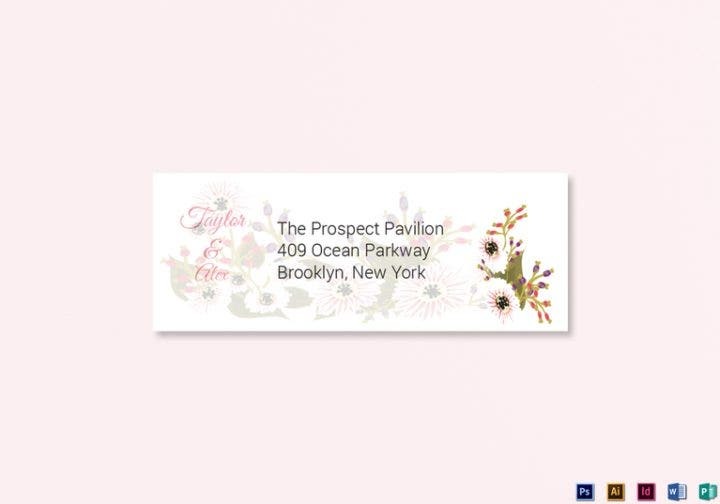 This floral wedding address labels card template uses some nice colorful flower designs. The flowers are placed at the right-hand corner of the template while another set of flowers are incorporated in the background. Flowers are always great symbols for weddings and the trend continues with this floral wedding card template. The template has a 2.6- x 1-inch size and the template was created using Illustrator, InDesign, MS Word, Photoshop, and Publisher. 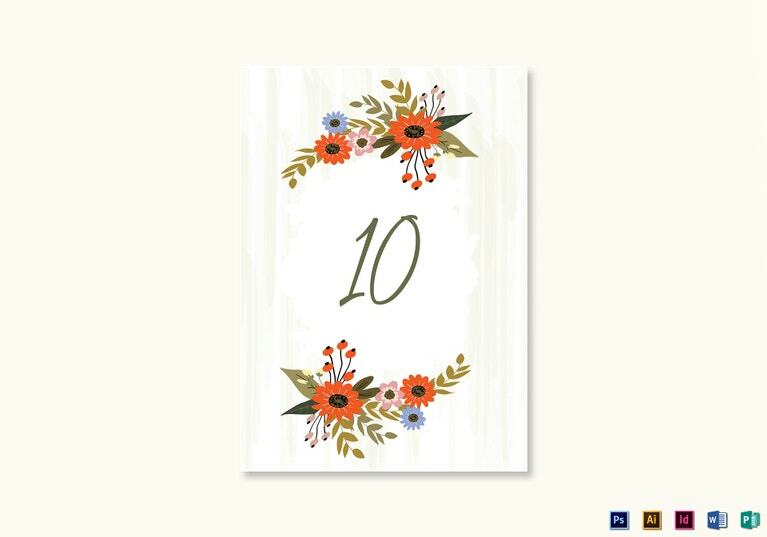 Watercolor designs are also unique designs to use in wedding cards. This watercolor wedding invitation card template uses purple watercolors in the background where the names of the couple are written. 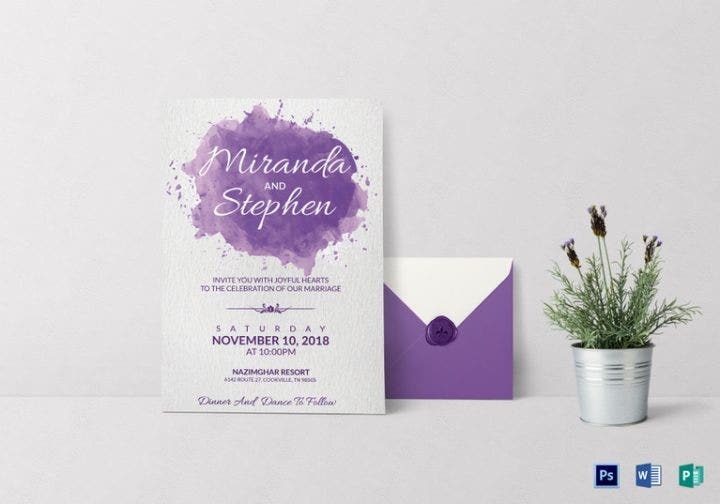 Although no photos are used in this template, the watercolor design and purple text are enough to make this wedding card template attractive. This template has a 6- x 8-inch file size and was created using MS Word, Photoshop and Publisher. This is a very unique and original wedding card design as it uses an origami design. The groom’s tuxedo, the bride’s dress, and a heart are made into miniature origami designs and are attached to the wedding card. This wedding card has a 5 x 7-inch size and also comes with a free white envelope. 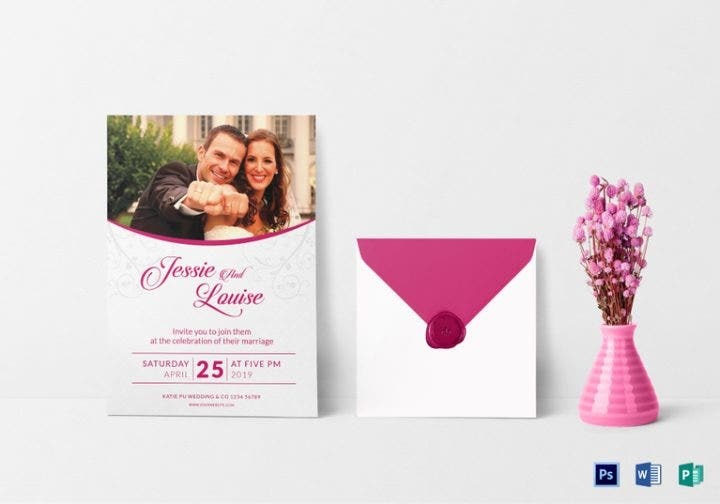 Similar to the wedding card templates, this classic wedding invitation card template also uses a minimalist design where at least two color combinations are applied together with one or more images. This template uses a photo of the married couple kissing that is complemented with attractive calligraphy font. Edit this template to fit your own wedding celebration. This template has a 4.25 x 9.25-inch file size and was created using MS Word, Photoshop, and Publisher. Summer is a great season to get married. No rains are expected which makes it the perfect photo opportunity for the couple and their families. The only downside with summer is that it gets too humid outdoors. The weather will surely cause some uneasiness among the guests. You certainly don’t want to take photos of the married couple drenched in sweat. Going back to the template, this summer floral wedding table card template uses some nice summer flower designs having colors representing summer like orange, pink, and blue. Pair these wedding table cards with some real flowers to make it more attractive. This template has a 5 x 7-inch size and was created using Illustrator, InDesign, MS Word, Photoshop, and Publisher. This is a personalized paper cut wedding day card which has a very unique and attractive design. 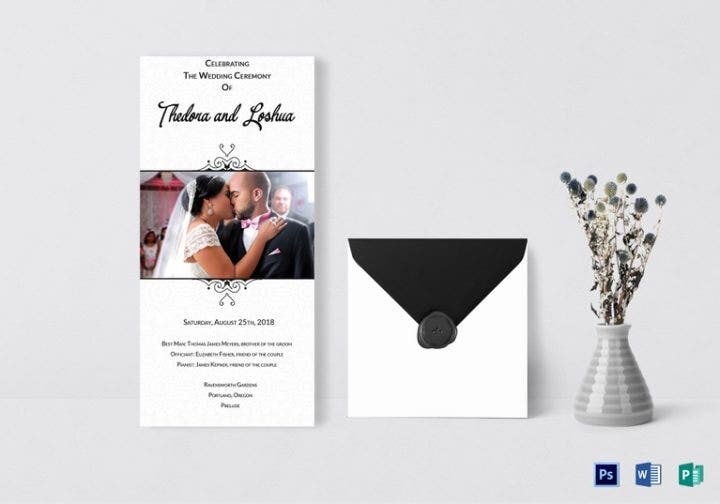 This wedding day card is made to order and can get delivered to your doorstep after a few weeks depending on your location, so make sure you order this template in advance. Different colors are also available for this template. 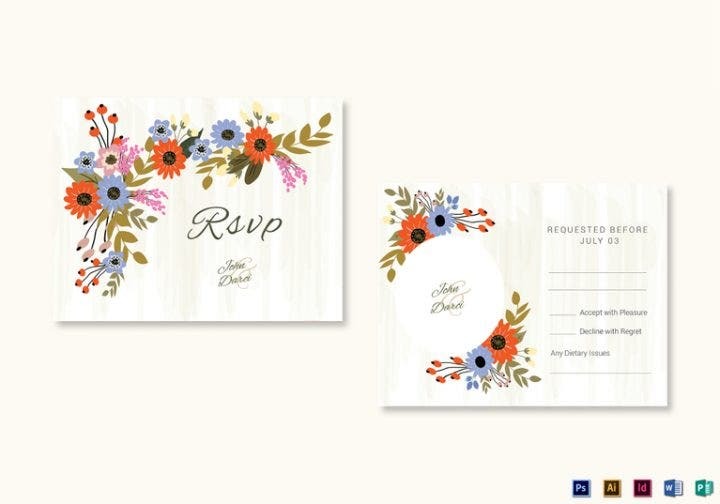 This summer floral RSVP wedding card template has a similar design to the wedding card template above. 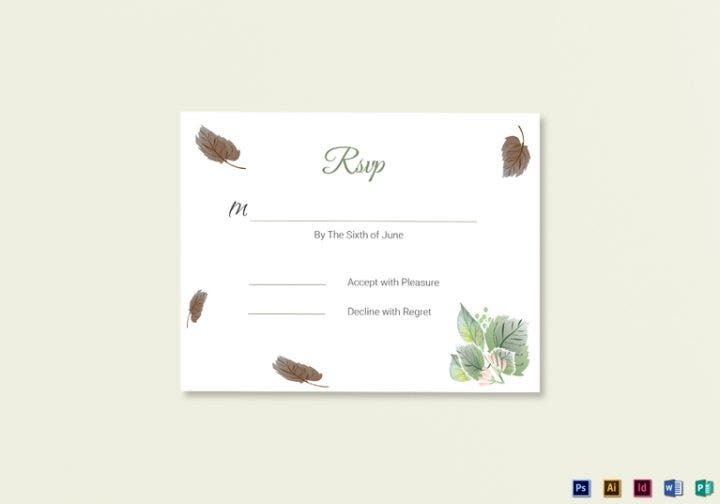 More flower designs are used for this template but it retains the same designs as the previous wedding card template.This template has a 5.5 x 4.25-inch size and was created using Illustrator, InDesign, MS Word, Photoshop, and Publisher. 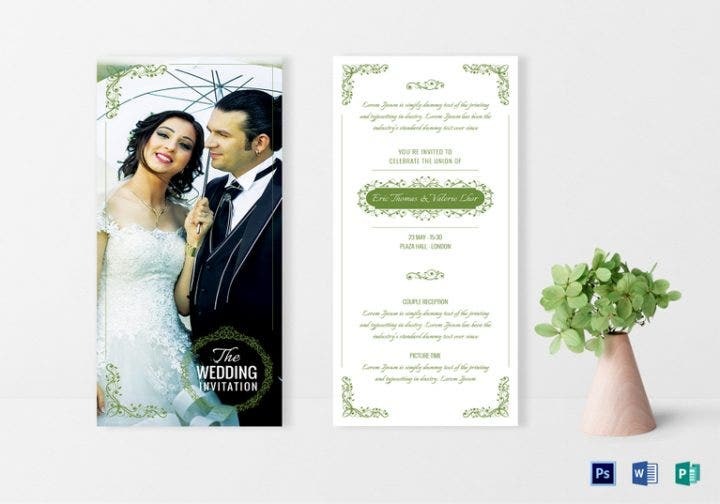 This elegant wedding invitation card template uses the photo of the couple as its main design. Nothing is more appropriate than using the married couple’s photo as the central design. This template uses some green color for the text. The template has a 4 x 9-inch size and was created using MS Word, Photoshop, and Publisher. Gold is one of the best colors to use for any design. The color exudes elegance and matches with any other color (although red and blue are the colors that pair perfectly with gold). This gold wedding thank you card template uses gold for the text in a white or brown-colored background. This card measures 4.25″ by 5.5″ (standard A2 size). 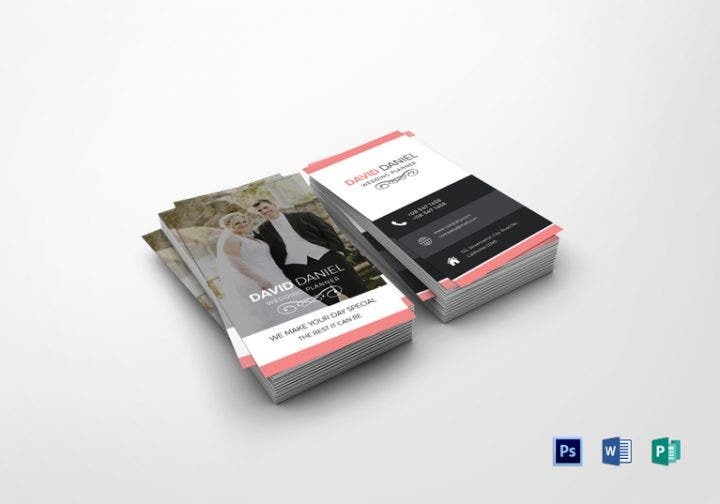 This wedding business card template perfectly uses a business card design. This wedding business card template follows the same design format used in business cards—horizontal and vertical line designs. This template uses a pink and black color combination and also incorporates the photo of the married couple. This template has a 2.25 x 3.75-inch size and was created using MS Word, Photoshop, and Publisher. 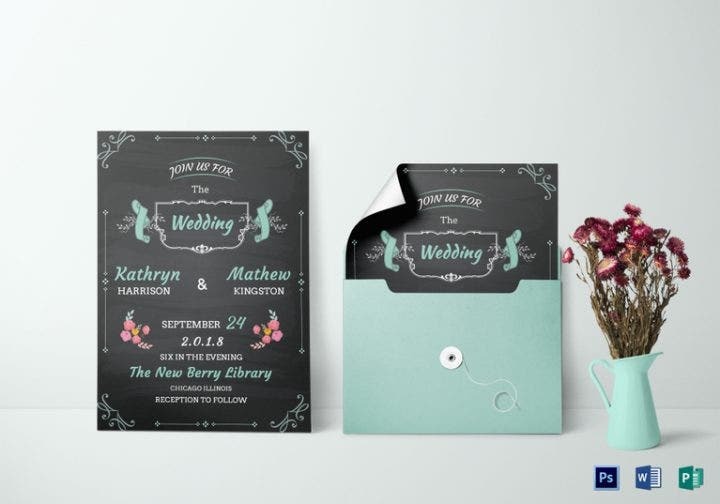 This wedding invitation card template also uses a chalkboard design which has been very popular to use for any event or occasion the past few years. Blue and pink-colored chalkboard style text are used to complement the chalkboard background. The template has a 7 x 5-inch size and was created using MS Word, Photoshop, and Publisher. This is another very unique wedding day card similar to the origami wedding card envelope template. The card features two Elasmosaurus wrapping their necks together and forming a knot. One Elasmosaurus is wearing a top hat and bow tie while the other is wearing a veil of flowers. This wedding card template approximately has a 4 x 6-inch size. Colors bring life to any design. Aside from providing visual attraction and aesthetics, it also convinces people (which in this case are the wedding card recipients) to attend the wedding if they are still hesitant about actually going. This is not to conclude that colors can persuade people to attend any event, but they certainly play a part together with images and other designs. Images are more effective, though, but the color is right up there in terms of importance. There is no limit on the designs you can use in making wedding PSD cards. Rely on photos or images rather than using layers of text as these look more attractive. 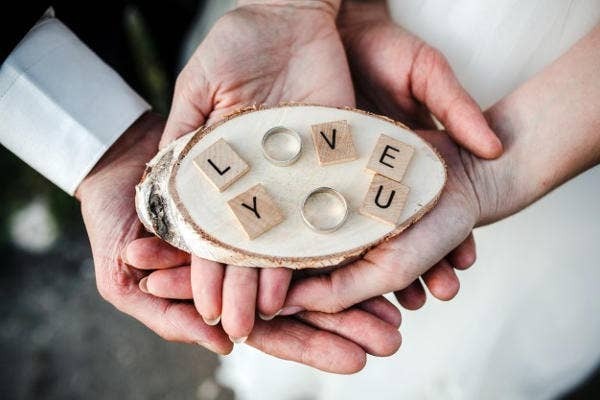 Only limit your text to the important wedding details such as the names of the couples getting married, wedding date, venue, and other important information. Even if you have purchased templates from the ones listed above, it doesn’t mean you won’t take any liberties with it. Most templates are easily editable using design software like Photoshop, so add a few more designs or detail as long as it doesn’t look overstuffed. Add some color and add a few more images related to wedding celebrations like flowers, ribbons, rings, veils, bow ties, and the like. So there you go, some beautiful wedding card templates you can use for different wedding cards like invitations, RSVP cards, and rustic thank you cards. They are attractive yet very affordable, so make the purchase now.